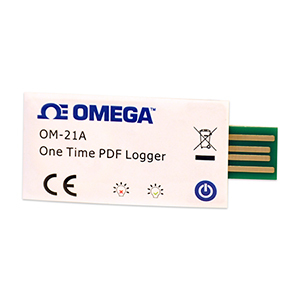 The New OM-21A PDF data loggers are ideal for monitoring the temperature of perishable goods and sensitive equipment during transportation and storage. Simple operation to start and stop recording by pressing a button. True plug and play: generates a pdf data report by plugging into the USB slot on any computer. No software or drivers are required. EN 12830 compliant temperature recorder, suitable for temperature recording during the transport, storage and distribution of temperature sensitive goods such as chilled, frozen and deep-frozen food and ice cream. Up to 6 mark points can be manually entered at the press of a button whilst logging, the RED LED flashes once to indicate a point has been marked. This can be useful for identifying when packaging may have been opened or the item moved from transport to storage etc. Note: The programmable model OM-21A-P-10PK allows end user to configure the Sampling Rate, Alarm Range and Delay Times with the free to download software.